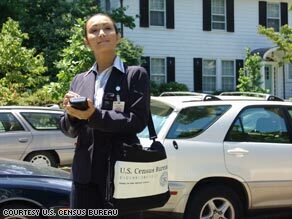 Census bureau employees, such as this one, gather federal data. Editor's Note: Update – According to the Census Bureau numbers released today, the 2008 poverty rate was 13.2 percent, up from 12.5 the previous year. The number of people living in poverty in 2008 was 39.8 million, up 2.6 million from the year before. On Thursday morning, the Census Bureau will release data expected to show a “statistically significant” increase in the national poverty rate, the percentage of Americans living below the government poverty line. Based on an Associated Press interview with a Commerce Department official, the expectation is that there will have been nearly 39 million Americans living below the poverty line in 2008 – an increase of more than 1.5 million from the year before – pushing the poverty rate up to at least 12.7 percent, if not higher. In reality, that number and that rate are something of a fraud. In the first decade of the 21st Century, the U.S. government still determines who is poor with a formula created in 1963-64 using data from 1955. Ike (Dwight David Eisenhower) was President. The Rev. Martin Luther King was led a bus boycott in Montgomery, Alabama. Disneyland opened in Anaheim, California. The Brooklyn Dodgers – yes, Brooklyn – beat the New York Yankees in the World Series. That formula is based on the percentage of household income a family of four in 1955 spent for food – on a diet “designed for temporary or emergency use when funds are low” – multiplied by three to account for one-third of household income. The Consumer Price Index is used to adjust the line upward annually. The line then was set at $2,442 for that family of four. A separate formula gave the rural poor less than the urban poor, but that index eventually went away. Needless to say, “that” America no longer exists. In 2009, the poverty line is set at a household income of $22,050 for a family of two adults and two children and $10,830 for a single adult under age 65. In 1955, Americans spent about one-third of their household income on food. We spend more for energy (18 percent of household income on transportation alone; aside from heating and cooling our homes and operating factories and offices). We spend more on housing (almost one-third of household income). We spend on child care (a concept that barely existed in 1955, when it was assumed most mothers stayed at home). The existing “one size fits (almost) all” formula does not account for differences in the cost-of-living between various regions or between big cities vs. small towns. Critics maintain that by failing to include various forms of public assistance payments received by low-income people, the extent of poverty is over-stated. If the value of food stamps and other programs were counted as income at the current poverty level, many people would no longer be classified as poor. So why not change the formula? Like anything else involving government, once it gets rooted, it’s hard to remove. If you change the formula and move the line up, the number and percentage of people nationally classified as poor will go up. “Nobody wants to see that happen on their watch,” Debra Johnson, editor at the Institute for Research on Poverty, based at the University of Wisconsin, told me several months ago. Some cities, counties, states and congressional districts could see increases in their percentage of poor that would vault them ahead of others in this undesirable category. By most estimates the federal government has spent at least several trillion dollars combating poverty over the past four-plus decades and where there’s federal money there are politicians who don’t want to see their pork sliced or pulled. Who is pushing for change? Members of Congress have introduced bills. The mayor of New York ordered his city to devise its own formula and wound up with a baseline income of close to $50,000 for a family of four, more than twice the current national guideline. Think tanks have issued reports. Of particular note, the National Academy of Sciences, which brings together the smartest of the smart, has devised a formula that fits today’s America. The AP reports that if you use the alternative formula proposed by the Academy, the poverty rate in 2007 was 15.3 percent, not 12.5 percent. The rate for Americans age 65 and older would have been 18.6 percent, not 9.7 percent. Some demographic groups would register a decline in their poverty rate. Some regions would experience an increase, others a decrease. Taking public assistance payments and other forms of federal aid into consideration might change who is eligible for such programs as Medicaid. You would think that when discussing spending tax dollars on programs to help those in need, you would want to have the most accurate gauge possible. That means using a formula that makes sense for today, not nearly 55 years ago. It’s time to move that line. I am confused, not really but that's politics. Your headline and base article leave one thinking the number is overstated at least thats what I thought. Then you get to after the jump and the reality is, if you consider the 21st century, that more people would be on th Poverty line, and we are not going to change the stats because of the politically motivated " not on my watch". Since when was that government of the people for the people and by the people? The reasons, energy costs, health care costs, and peoples growing lifestyle expectation are why its changed. If you point that out when you publish the new statistical data and causes of change 90% of people at least can understand. We might be just voters but we are not totally stupid. Let's move that line is fine, and dandy, but is it indicative of how those at the lower end think,and rationalize? There are statistic's for everyone,and everything ,such as what's in the basket that defines "Cost of Living" (inflation/deflation),minus food,and energy. Wow! Food,and energy? Minimum wage is one way to compensate the poor,and Medicaid (Welfare),and food stamps. Now,let me tell you, I'm not a cruel person,or self-righteous,but no one tells these kids,families to have ten children (exaggeration to prove a point),I've been there. some people just don't get off on material rewards,or superficial living that has taken this country out of context,and has lost it's ways. Remember,if you move the line,you invite more inflow,to the never ending bread-line (yummy) ,and could create something that you can't take back,such as freedom to choose,...? They say that the Unemployment Rate is like 9.7 % now. But that doesn’t include all them recent college graduates like myself who don’t even qualify to file for unemployment. Census that “You” Joe Biden who gets funny haircuts and looks like a dufus on national TV! Even with a new formula based on today's financial conditions the percentage of those living under the poverty line will still probably increase. I suppose if you feel poor then you probably are poor – and you may not want to know just how poor you are. Right now a lot of us who used to be middle class are looking a that poverty line up close. Its just as ugly up close as it is from afar. It won't surprise me what numbers ACORN come up with!